TOKYO (Reuters) - Bank of Japan Governor Haruhiko Kuroda said the central bank would eventually need to consider how to normalise its ultra-easy policy, suggesting the priority of his next tenure could be to dial back a massive stimulus he deployed five years ago. But Kuroda reiterated that it was too early to debate specific means to whittle down stimulus with inflation distant from the BOJ's 2 percent target. "We'll do our utmost to hit our price target. But we'll also need to eventually consider kicking off a process towards policy normalisation," Kuroda said in his inaugural news conference after being formally reappointed for another five-year term. "I think the process of any shift (from easy policy) would be cautious and gradual, as with U.S. and European central banks," he said. In the first five years as BOJ governor, Kuroda's main task was to deploy a massive stimulus programme to break Japan out of two decades of grinding deflation. While Kuroda's stimulus helped reflate growth, it has failed to accelerate inflation to the BOJ's elusive 2 percent target. Given the rising cost of prolonged easing such as the hit to bank profits from ultra-low rates, the central bank is facing growing calls from lawmakers and analysts to explain clearly how it plans to dial back its ultra-loose monetary policy. Kuroda said central banks must always be mindful of the demerits of prolonged easing, regardless of whether they were implementing conventional or non-conventional steps. Among notable demerits the BOJ must look out for were the risk that prolonged monetary easing, and a shift towards an exit, could disrupt Japan's banking system, Kuroda said. Still, the BOJ's priority now was to maintain its massive stimulus programme to achieve its inflation target, Kuroda said, stressing his resolve to keep policy ultra-loose. "The economy and prices are doing quite well now but there's some distance to achieving 2 percent inflation," Kuroda said. "It's inappropriate to tighten policy or diminish monetary support to create policy room to cope with a future downturn" in the economy, he said. The BOJ will maintain its current policy framework until it becomes clear inflation has hit its target and stands ready to ramp up stimulus if the economy loses momentum, Kuroda said. The government has kept pressure on the BOJ to maintain its huge monetary support. Premier Shinzo Abe said he told Kuroda in a meeting on Monday that the BOJ should deploy all means available to achieve its price goal and help reflate growth ahead of next year's sales tax hike, according to Kyodo news agency. 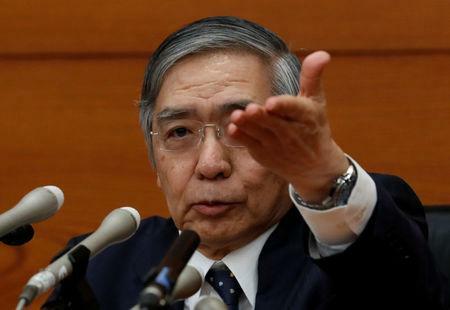 Kuroda told the briefing that Abe did not make any specific requests for additional monetary easing. But core consumer inflation stood at 1.0 percent in February, well below the BOJ's target, as slow wage growth kept consumers from increasing their spending. Some analysts worry that a scheduled sales tax hike next year and uncertainty over escalating U.S.-Chinese trade frictions could cool growth ahead. Kuroda has repeatedly said the BOJ is in no rush to follow in the footsteps of other central banks in exiting crisis-mode stimulus. But he has also offered more clues on key points the BOJ would look out for when it rolls back easy policy.